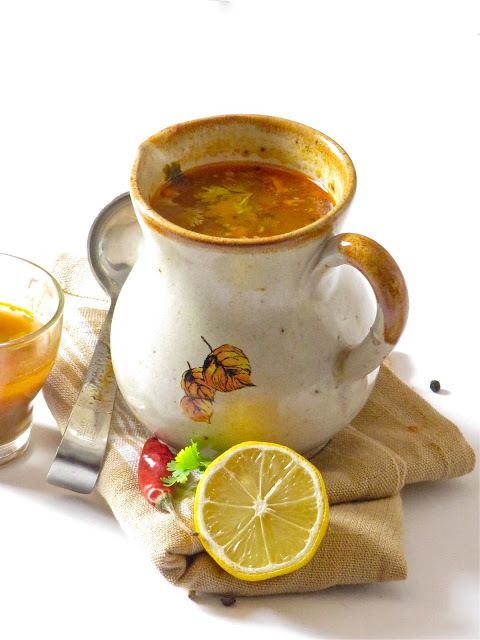 Rasam is synonymous with soup. Sassy, clear soup. A South Indian staple. Pleasantly light, fabulously sour and delightfully spicy. With full flavors of—sweet, sour, salty, spicy—in every bite. Ahhh, bliss! 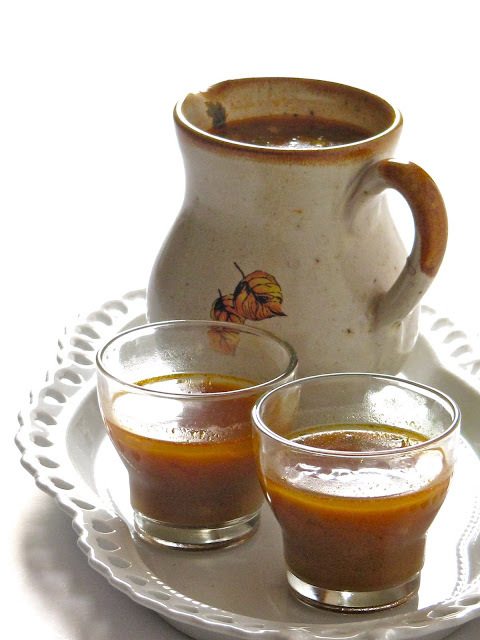 Besides, a glass of rasam is a surefire way to boost your health and spirits whenever you are under the weather. Oh yeah. The punchy flavors are good for whatever ails you, and -- equally good for digestion, too. This lip-smacking recipe is flavored with tomatoes, lime juice and tamarind, imparting a powerful kick. Spices like pungent asafetida, hot red chilies, aromatic turmeric and coriander are added for a striking flavor, whereas, salt softens the bite of tamarind and tempers the heat of spices. Seasoning with mustard, cumin and curry leaves transports this dish to a new level with its compelling savory fragrance. 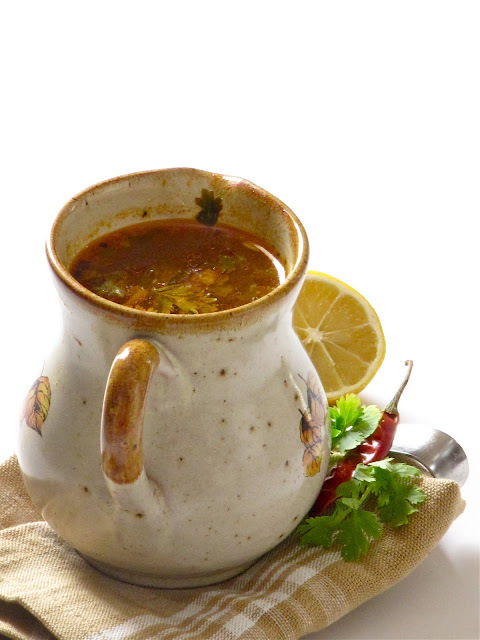 In a nutshell, rasam is a much lighter and diluted version of sambar, yet with a distinct and more appealing flavor. A truly comfort food. Enough. Let me stop this inarticulate babble and dive into the recipe. Puree tomatoes in a blender or food processor; set aside. Crush ginger, garlic ans shallots using a mortar and pestle. Cook dhal in 4 cups water until very soft and mushy; then give it a quick pulse in a blender. Set aside. Meanwhile, heat 2 tablespoon oil in a large deep pan over medium-low heat. Add mustards and cumin and fry till they splutter, about 30 seconds. Tip in curry leaves, red chili and few coriander leaves and toss for 5 seconds. Add ginger, garlic and shallots and cook until soft and fragrant, about 2 minutes. Now add all the powders -- asafetida, pepper, turmeric, coriander -- and cook, stirring, until fragrant, about 1 minute. Stir in tomato puree and tamarind water and simmer for 2 minutes. Pour in mashed dhal, season, and cook for 6 minutes over medium heat, stirring occasionally. Reduce heat to low and dilute the soup by adding 3-4 cups of water, depending on how thick/thin you prefer it. Keep in mind that the flavors are punchy enough to be served very thin and still enjoyed in each sip. Drizzle with the lime juice, tip in the jaggery, scatter with the remaining coriander leaves, and then simmer for 10 more minutes, until it starts to froth. Finally, taste and season with salt and a touch more lime juice, if you like. Serve hot. Make sure to give a quick stir before ladling into glasses, as the spices tend to settle to the bottom. 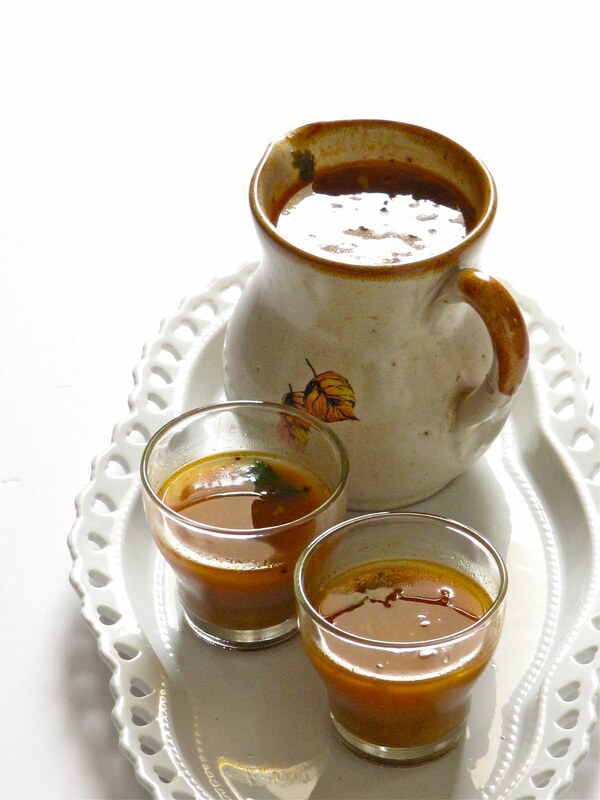 Enjoy sips of rasam straight from the glass, or with steamed rice, if you like. Whatever, it’s very comforting and you’ll want seconds. Bon appétit and happy weekend everyone! Aiyyooooo! I am drooling all over the keyboard *slurp* . you have wonderful weekend too :) . 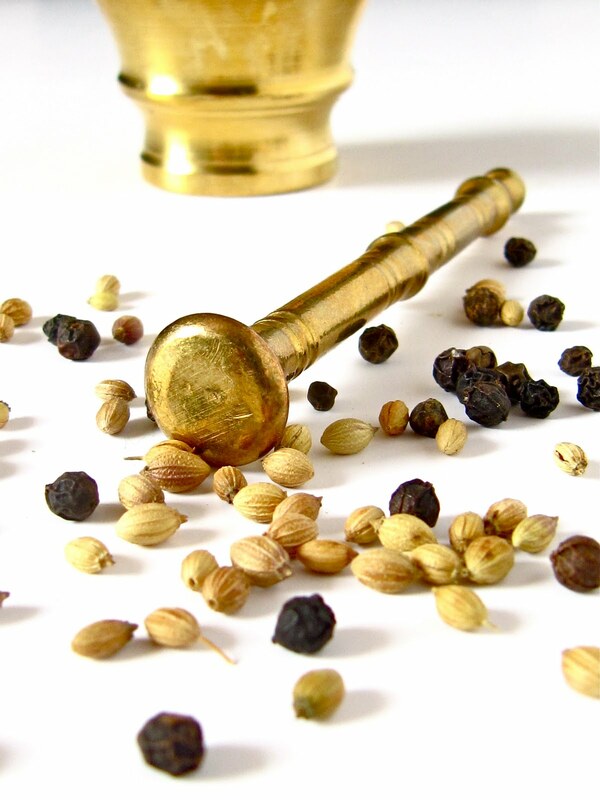 Nice spicy rasam, loved that authentic spice grinder. OOOppss its rasam an all time fav! !OMG it cannot be presented better than this!!! The pictures are amazing. Sounds yummy with all these lovely flavors going in there! lovely .. u really take time ...!!! a lovely tribute to rasam--- looks delightful & very very yumm !! I have never made a sweet and sour soup, but simply must! Looks wonderful. Makes me yearn for a bowl right now. This is totally divine. This is what I am searching for. Never tried at home. But will definitely try this. Thanks for sharing. Wonderful clicks! Gr8 pics as ever. Love the pot! Comforting rasam, i can survive for many days with this wonderful soup..beautiful clicks as ever..
To me rasam has never looked so beautiful. I loved the way you have presented the rasam. Yummy yummy rasam..looks fabulous,lovely presentation and great pic as always dear. Beautiful clicks kto Nashira :)...a M& P enikku othiri ishatppettu.. I've never made rasam at home and only had once at by friends house..will follow ur recipe and try this dish on the weekend..thanks for sharing! Again loved the clicks!! 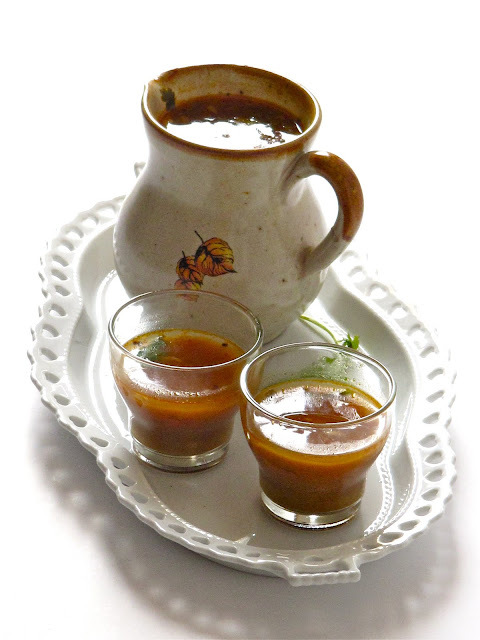 Delicious rasam with a presentation like that will disappear in no time.Good weekend to you. Always comforting.. loooovvveee your pot of rasam.. Tempting clicks and wonderful rasam! Very tasty and tangy looking rasam dear. Excellent preparation. Wow! wht a comforting drink. would love to have it any time.. Awesome click I must say..
Rasam is my every day food but didn't know it can look this beautiful until I saw your clicks. Super delicious. sure a tasty soup or rasam..liked ur recipe a lot..that jug is very cute..
Rasam looks so delicious.. very beautiful picture.. I love rasam and in a hot afternoon with some rice too! I have always enjoyed rasam but never made it at home :) Your clicks are just gorgeous and that white balance is so perfect. Please give me some gyan on how to work on reducing those shadows! The Rasam is very appealing in the photos. Nice porcelain jug and brass mortar and pestle. Thanks to your prose I can almost taste this tangy soup. whoooooooooooo...adipoli clicks, all I need is hot rice to enjoy this yummy, tangy rasam..sherikum kothiyaunuttooo.. Believe it or not I never had rasam but I always wanted to make it. Hubby keeps raving about the rasam he used to eat at some restuarant when he was in Banglore ~ have been looking for a good recipe forever! 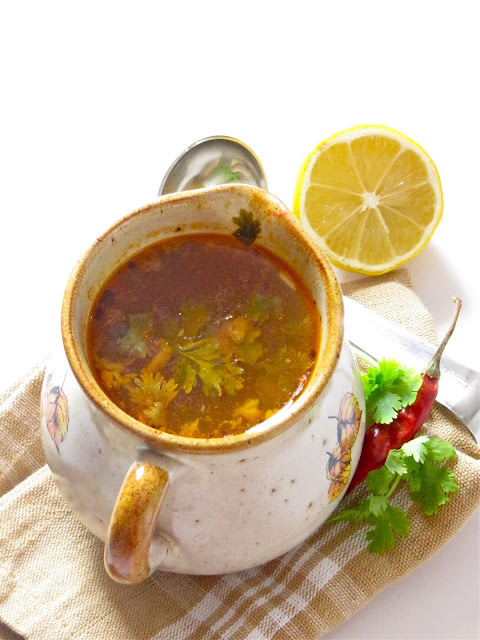 Your rasam looks so spicy n flavorful will look forward to try it. Wonderful clicks! I too agree with sarah,never seen so gorgeous click of the rasam b4 so far! Lovely clicks, my comfort food with rice ...perfect! At home we too love rasams anytime...esp on a cold rainy day!!!! Ur clicks so appealing & lip smacking...Wanna grab that pitcher & savor it!!! A magnificent soup! I love hot and sour food. Yummy! Looks too good. 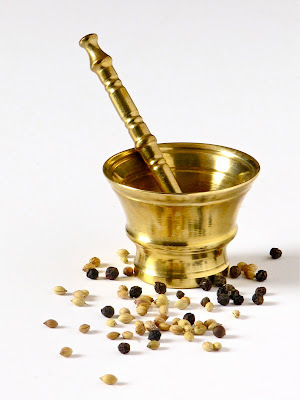 Rasam is perfect for the kind of whether we have in Kerala. Love all the spices that go into it. Loved the 6th and 7th photos the most. Always such interesting recipes and breathtaking photos. First of all your mortar and pestle looks amazing. My fav rasam. Loved the flavours. You make everything perfect dear. I love rasam. Your recipe sounds wonderful. Will try your version next time. The clicks are amazing as usual.. Thanks a ton everyone for your ever sweet comments! You are the best!! This looks great and is on my must-make list. Thanks for sending it to House Favorites! Have shared few awards with you, please accept the same.Thanks!! wonderful pictures - this looks great! Next time I throw one of my famous Indian feasts, this will definitely be on the menu! I love that it's really light but flavorful. Thanks for posting. Hi there, the June wrap-up of House Favorites is up. Thanks again for your entry! This looks so good I want to try it! Thanks so much Beena, Claire, Suman, Simply Life, Cathy and Lisa! I loved as much as you'll receive carried out right here. The sketch is tasteful, your authored subject matter stylish. nonetheless, you command get got an impatience over that you wish be delivering the following. unwell unquestionably come more formerly again since exactly the same nearly a lot often inside case you shield this increase. An impressive share! I've just forwarded this onto a colleague who has been doing a little research on this. And he actually bought me breakfast due to the fact that I found it for him... lol. So allow me to reword this.... Thanks for the meal!! But yeah, thanx for spending the time to discuss this matter here on your blog. I'm really impressed along with your writing skills and also with the format to your weblog. Is that this a paid theme or did you modify it yourself? Anyway keep up the excellent quality writing, it's uncommon to see a nice blog like this one these days.